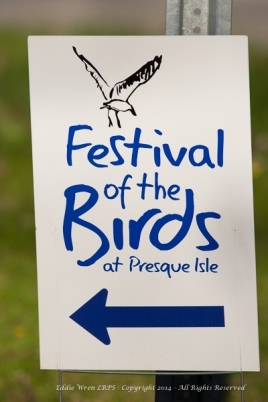 Audubon’s “Festival of Birds” weekend at Presque Isle. When it comes to variety and rarity, Pennsylvania’s birdiest place is a 7-mile-long spit of land that extends into Lake Erie from the city of Erie. Though it’s made of sand, Presque Isle State Park seems to have magnetic qualities for migrant birds, both regularly occurring species and long-distance wanderers. More than 320 species have been found in this relatively miniscule sliver of beach, ponds, marsh and woods. Though many records are of once-in-a-lifetime vagrants, the odds are better here than anywhere else in the state that something unusual will turn up…. Only six of our WWNP group made the 2-hour trip from Buffalo, NY, to Presque Isle on 11th May (although, to be fair, it was Mothers’ Day! ), which was nice in terms of our small group size at the park but a pity for those who missed it. Two-thirds of the WWNP ‘A-team’! The day we went was also the final day of the Audubon Society’s ‘Festival of Birds’ weekend, and to be honest I was astonished at how few people — relatively speaking — appeared to be at that event, too, although I suspect they may have limited the numbers on purpose…. No bad thing! 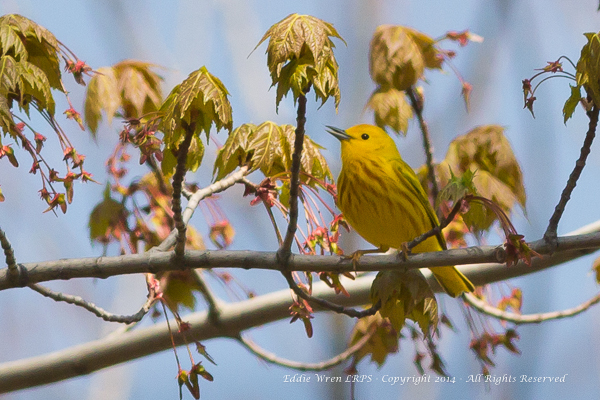 A bright Yellow Warbler, surprisingly well camouflaged amongst the opening buds. (The rust-coloured streaking on the breast shows this to be a male, supported by the fact that it is singing.) Photo copyright 2014, Eddie Wren. All rights reserved. Of course, now that spring has eventually arrived (and not before time!) the trees buds are starting to open and are doing two things to nature watchers and photographers, namely making the spring ephemeral flowers wilt and disappear, and making it harder to see — and particularly to photograph – small warblers! The result is that we saw several more species than we were necessarily able to catch on camera. 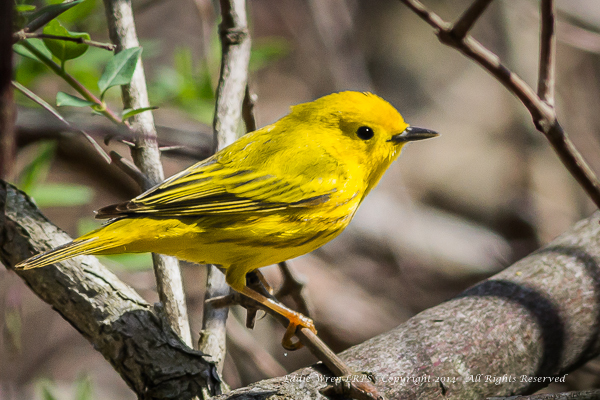 A lightly-marked Yellow warbler, indicating that it is a female. (Males have red or rust-coloured streaking on the breast.) Photo copyright 2014, Eddie Wren. All rights reserved. The other delightful aspect, however, came from the fact that just as Julie Andrews’ hills were apparently alive with the sound of music, so the woodlands of Presque Isle were absolutely brimming with the sound of bird song. This fact, along with unbroken sunshine and temperatures in the high seventies, meant the day simply couldn’t have been better. 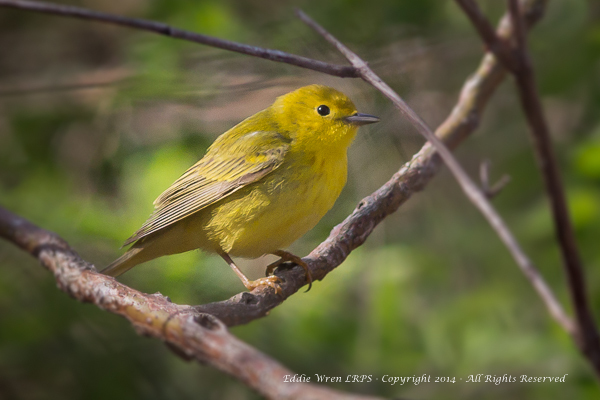 Another Yellow Warbler, glowing in the full sunshine. Photo copyright 2014, Eddie Wren. All rights reserved. 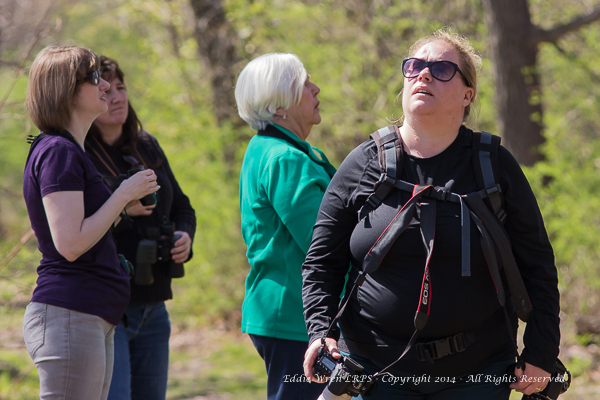 Birders and bird photographers wait patiently (or impatiently!) for months, for the 3-4 weeks of the main warbler migration period each spring but the problem is that, once it’s here, it hurtles past so quickly. 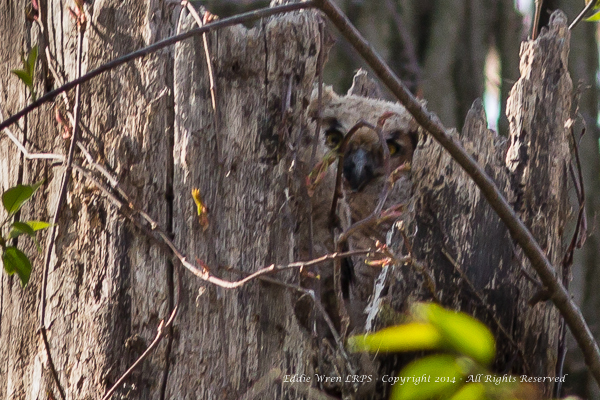 Great Horned Owl chick/owlet, absolutely motionless, watching us watching it! Photo copyright 2014, Eddie Wren. All rights reserved. Early in the day, Andrea introduced us to a friend of hers, Brian Berchtold, who is a Presque Isle State Park ambassador/ volunteer and wildlife photographer. Amongst other things, Brian was kind enough to take us to see a Great Horned Owl’s nest, from which one of the two owlets could be seen peeping over the edge of the broken tree trunk and watching us watching it. One of the parent birds remained nearby but with not only branches but the aforementioned opening buds constantly thwarting our view, I don’t know whether any of the group got good photos of the mature bird. 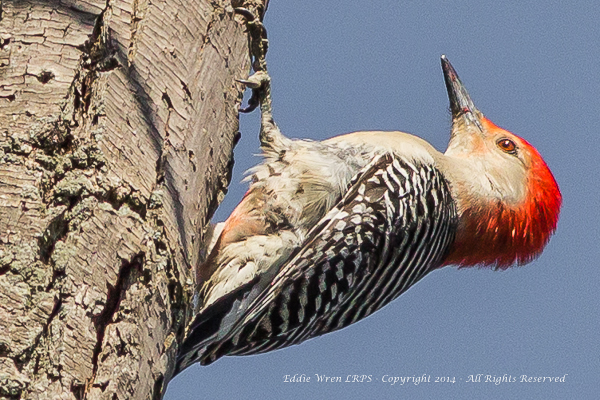 A male Red-bellied Woodpecker searching for food. Photo copyright 2014, Eddie Wren. All rights reserved. For my own sins, I was also engrossed with a new lens that had arrived via UPS less than 36 hours previously: a Canon EF 300mm f/4L IS USM, to give it its grand title (and which was used for all the photos on pages one and two of this post). Sadly, my current camera doesn’t have ‘back-button focussing’ which I rather suspect made me a bit slower with the warblers than might otherwise have been the case. Never mind; that can be rectified in due course. 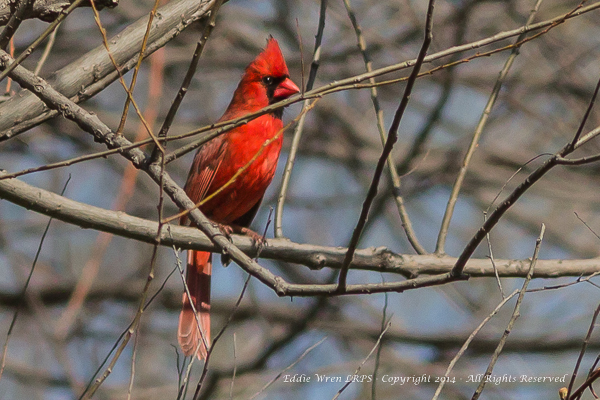 Ever spectacular, a male Northern Cardinal. Photo copyright 2014, Eddie Wren. All rights reserved. Highlights of the day included excellent views of several relatively common but still spectacular birds, such as Baltimore Orioles, Yellow Warblers, Yellow-rumped Warblers, Palm Warblers, Black and White Warblers, American Redstart, Red-bellied Woodpeckers and one of nature’s finest — Northern Cardinals. One of several important signs that some people saw fit to ignore! 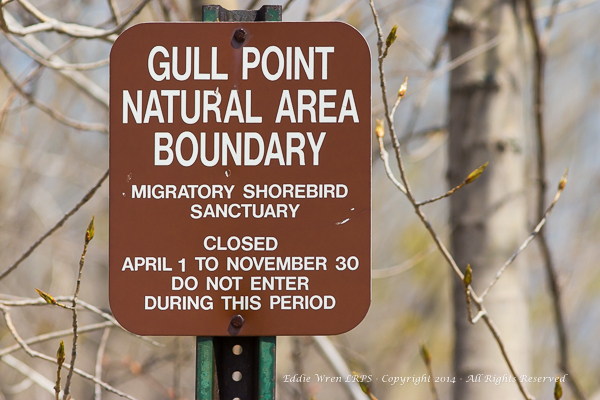 If there was a down-side to the day, it was the fact that at the eastern tip of the Presque Isle peninsula I saw several people blatantly ignoring signs telling everyone to keep out of sensitive nesting areas — one of the few situations in life that can make me wish I was still a police officer! This entry was posted in Birds, Conservation Issues, Eddie Wren - articles by, Migration, North America (preserves & reserves), Owls, Passerines / Songbirds, Pennsylvania, Photography - Wildlife & Nature, Photography Equipment, USA (preserves), Wildlife - Nature - Natural History, Wildlife Events, Wildlife Reserves and Preserves, WWNP Group photos and tagged Birds, Book Reviews - Nature, Great Lakes, Lake Erie, migration, Pennsylvania, Presque Isle, Spring, Warblers.